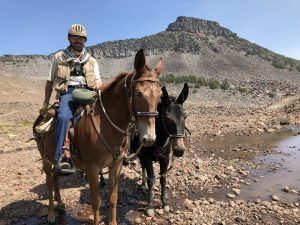 I recently had the opportunity to camp and ride with two of the most enthusiastic mule ambassadors that I’ve ever met. 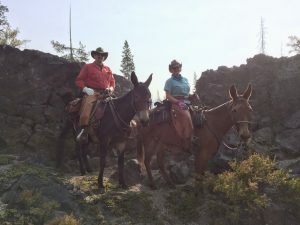 Joe and Jenny from the North Idaho Saddle Mule Club. 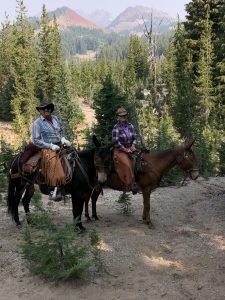 We rode and camped throughout central Oregon for two weeks, stopping at 4 different equine camps along the way and riding some phenomenal country. Together we shared fabulous trails, wonderful meals, and a more than a few laughs over the many mule misconceptions that we encountered! Mules cannot be ridden. While returning to camp one afternoon I stopped to chat with a family that was shocked to see someone riding a mule. Indeed, the first thing said was “I didn’t know you could ride a mule!” They thought mules could only be used as pack animals. I enjoyed sharing some of my mulish experiences with the uninitiated, but I think that these folks thought I was an escapee from a traveling circus. 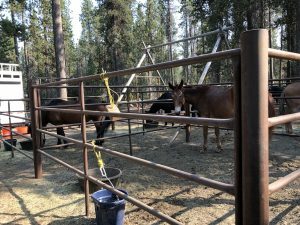 After a few days at Quinn we decamped and traveled an impressive 5 miles down the road to the Todd Creek Horse Camp where I would be completing my unfinished ride of 2017. For more info on the horse camp including accurate directions, GPS tracks, pics, and more, visit https://www.trailmeister.com/trails/todd-creek-horse-camp/ . Mules will attack horses. This was Jenny’s experience to share. While watering Jesse and Lacy, Jenny encountered a mother and daughter who promptly cleared the area around the stream used for stock water. The daughter then asked, “why do mules hate horses?” Evidently some people think that mules will attack any horse they encounter. Thank you, Jenny, for clearing up this misconception! The fourth destination for our Oregon odyssey was the Whitefish Horse Camp. With numerous camp sites, pressurized water spigots, and more, Whitefish was the best appointed of all the camps we visited in this trip. Combine the fantastic amenities with the easy access to numerous trails that loop and meander through the Diamond Peak Wilderness and you’ll quickly understand why this camp is a winner in all regards. 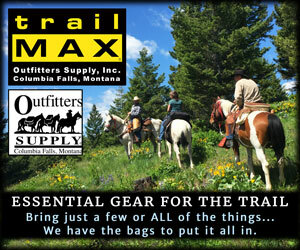 For more info on the horse camp including accurate directions, GPS tracks, pics, and more, visit https://www.trailmeister.com/trails/whitefish-horse-camp/. 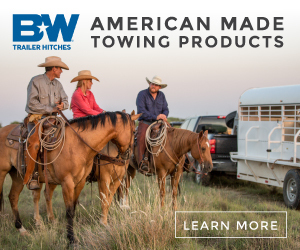 Mules will never colic or get sick. Our mule musings over dinner included reflections on the hardiness of mules. While it seems odd, I can say that my mules have fewer unplanned vet visits than my horses. 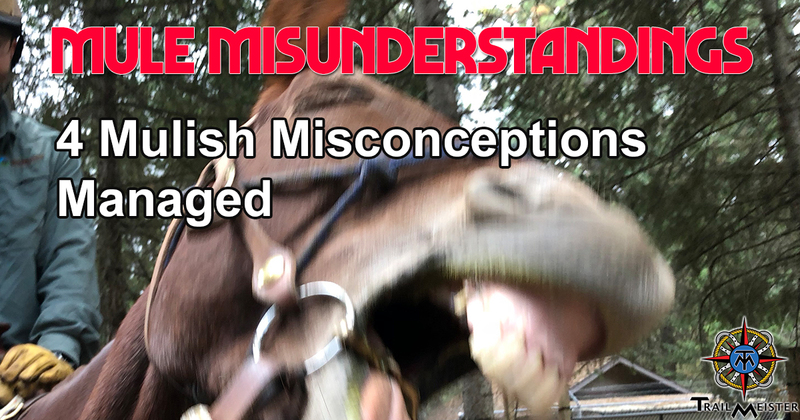 That’s not to say that I’ve never heard of a mule in distress, I certainly have, but rather to say that perhaps, just perhaps, the combination of hybrid vigor and a heightened sense of self-preservation helps mules take better care of themselves than their horsey kin. 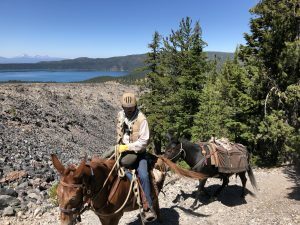 Well there you go, a very brief rundown of a fabulous couple of weeks in Oregon riding and camping amongst volcanoes and a few Mule Misunderstandings that we’ve hopefully cleared up!. For more information on these and other riding and camping areas throughout Oregon and the US visit www.TrailMeister.com!